I needed this length and every single one of these dust ruffles seems to fit a different heigth of bed! it ironed up very nicely. Now I can change the comforter and still keep the dust ruffle the same! This ivory cotton bed skirt is a great basic addition to use on any bed to coordinate with your quilts, duvets, and comforters. 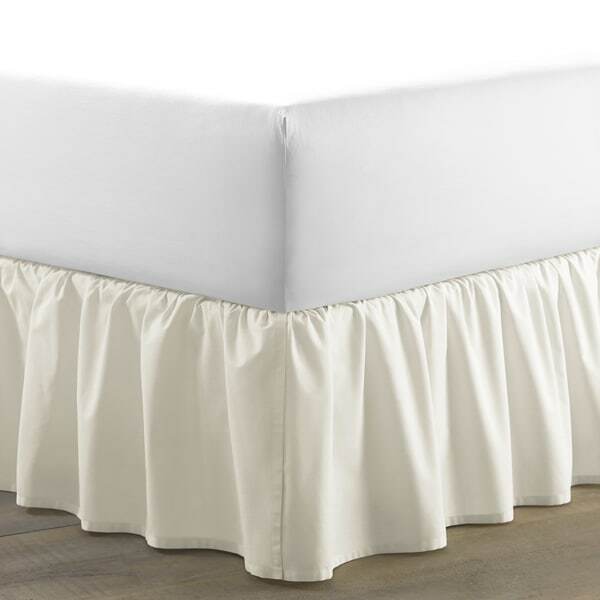 This bed skirt features soft ruffles, adding to the romance of your room and the split corners make it easy to fit on your bed frame. This fifteen-inch drop bed skirt is conveniently machine washable. This product is exactly as described. I purchased one for regular king sized bed and one for a full. They fit perfect. The color goes with a lot of other colors too. Excellent, exactly what bed needed. This bed skirt was described as queen size with an 18inch drop. We can barely get a 14 inch drop out of it. Very disappointed. This is just what i was hoping for! The fabric is supposed to be light and airy- that is the desired look. It went beautifully with the Laura Ashley bed in a bag set i also purchased from overstock. The ivory is not too yellow at all- it is very soft and is they type of ivory you can actually mix with whites- i feel that the quality matches the price- if i wanted high end i would expect to pay more- for the price, i am pleased and not at all disappointed. We used it on a queen in the quest room and it really finished the entire look of the room! I plan on buying another for my daughter’s full size bed in white. Of course it was wrinkled coming right out of the package but that didn't bother me....the bedskirt smoothed out nicely after a day all on its own because of the polyester content of the fabric. Also, another buyer complained about the the part of the bedskirt called the platform (I think) was so thin that she ripped it putting on the bed; I didn't have any issues as I had someone lift the mattress off the bed first while I adjusted the bedskirt on the box spring. It wasn't 100% cotton, but frankly I'm glad as it will be easier to care for. I purchased the Laura Ashley Ivory Ruffled 15" Drop Bedskirt to go with the Picadilly Queen 3-Piece Comforter Set from Overstock. It was wrinkled right out of the package, but after it was ironed the bedskirt looked beautiful. The quality of the bedskirt is excellent & goes perfectly with my comforter & really completes the set. I am extremely satisfied with my purchase! Picked this cotton bed skirt to match our cotton quilt & it's machine washable. Naturally, it was very wrinkled when removed from packaging; however, once washed, it was even more wrinkled. For the price, this should be permanent press. Also, color is not Ivory but more off-white. 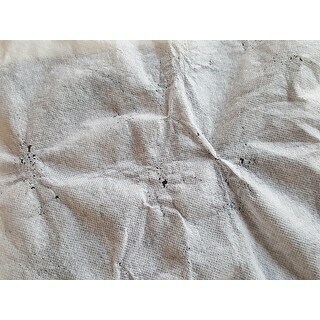 I have bought this bed skirt before in another color and it washes and wears great. Very happy with this purchase. I love all Laura Ashley bedding. Very soft and pretty. I had such a hard time finding a split-corner opaque bed skirt in this length. 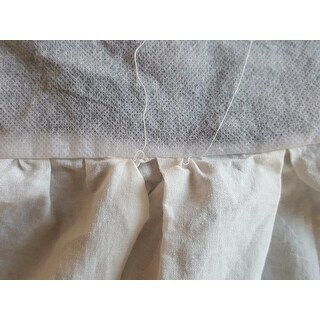 The skirt itself is fine, but the material that goes under the mattress tears very easily. I found this out while trying to adjust how the skirt hung. I'll probably end up eliminating the base material and using Velcro to attach the skirt directly to the bed frame. This is not the quality fabric I was expecting and I am a bit disappointed. As I pulled it through the edge of the bed to even out the height, the bedskirt tore apart. I was able to sew it back together, and it now looks fine, but would not purchase again. Material is thin, batting is cheep. It's not 18 in as advertised. The material in the middle ripped the first time I put it on the bed. Sewing job is less then adequate. I would consider something else. Bummer because I thought Laura Ashley was a decent brand name. Fits my kind photo sized bed all the way to the floor. Fabric too lightweight, always looks wrinkled. I thought this would be white but it is really off white. I still kept it and it looks nice on the bed. It matches my Laura Ashley Quilt. "What is the drop on this bed skirt? I need a 20" drop"
The drop length is 15 inches. Needed 15 inch drop for new bed.